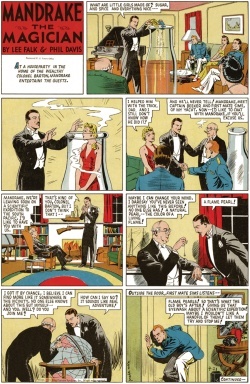 "The Flame Pearls Pt.1: Attempted Assassination" is the 14th Mandrake Sunday story. The story was written by Lee Falk and drawn by Phil Davis. At a houseparty in the home of the wealthy Colonel Barton, Mandrake entertains the guests. The Colonel tells Mandrake that he soon will be leaving on a scientific expedition to the South Pacific, looking for flame colored pearls, and he wants Mandrake to join him. Mandrake cannot say no to an adventure and soon he finds himself on the yacht Argos and the search for the Flame Pearls begins. But Captain Beeker and First Mate Sims are making plans on how they can get their hands on the Flame Pearls themselves. First Mate Sims, on Argos. This page was last edited on 1 November 2016, at 10:22.